Learn how agile methodology can help in growing your mobile app development business. ‘Agile Methodology’ - one of those buzzwords that has been in the limelight for quite a few years now. 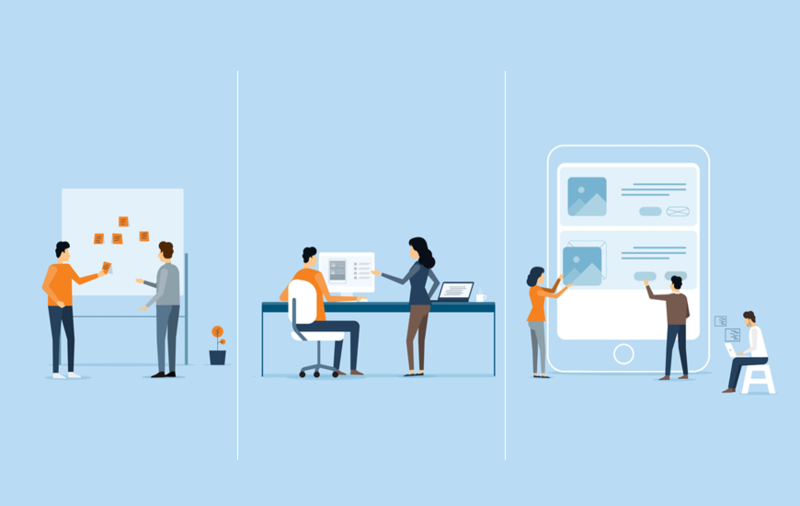 From mobile app developers to testers to professionals with a technical background, they are well of how important the agile practices can be. This is one of the main reasons why we decided to cover this topic of agile app development. In this article, we will be covering some of the major segments related to the agile scrum methodology including the meaning of agile scrum method, its benefits, as well as, the adoption of this technology. So without wasting any more time, let’s start with the basics of agile methodology and scrum method. 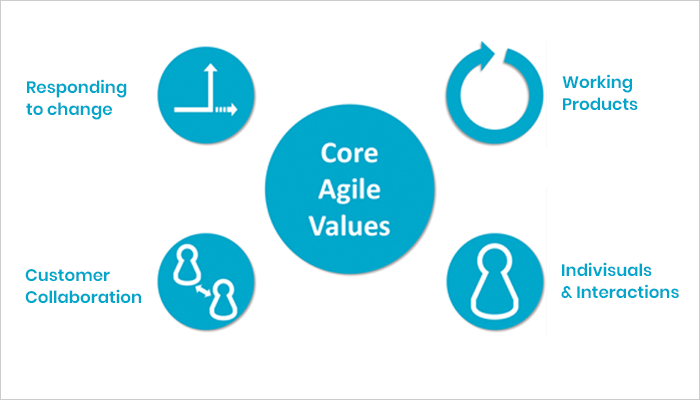 The term agile methodology can be defined as the practice of promoting continuous iteration of software/application development and testing throughout the complete lifecycle of that particular project. One of the main things that separates agile methodology with the waterfall method is its concurrent execution of activities. Now, let's talk about the agile scrum methodology which is basically an agile software development method. The scrum methodology is one of the most widely known agile app development methods. This agile scrum methodology can also be referred to as the method which is a combination of various agile models like the iterative model and incremental model. Due to the functionalities of multiple agile models, agile scrum method is very popular for managing the development of the product. Individual & Team Interactions over processes as well as tools. Responds to the changes by following a plan. Working Products/Software over Comprehensive Documentation. In comparison to the waterfall method, agile is considered flexible and allows dynamic changes to be made in the software or app development. In agile development, the lifecycle of the project development is divided into sprints whereas in waterfall method a sequential development process is followed. In waterfall, the testing plan is not prioritized but in agile methodology, it is reviewed after completion of every sprint. Agile Scrum methodology offers a high degree of coordination as well as synchronization whereas waterfall has a rigid and limited structure. The agile methodology is simply a collection of various projects and for waterfall methodology, the software development process is considered as a single project. In waterfall, there is no iterative process that means once phases like testing and development are complete there won't be any iteration. In agile, we can alter the description of project details anytime during the SDLC process which is not possible in the waterfall development method. These were some of the key differences between agile development and the waterfall approach. Next, we will be discussing why you should consider choosing an agile approach for your mobile app development process. Nowadays, the main aim of mobile app developers is to deliver high-quality applications with respect to their target audience’s preferences. But this high-quality status is not that easy to achieve as there are various hurdles that need to be crossed first. This is the part where agile methodology comes into action. These are some of the issues that mobile app developers face on a regular basis during the app development process. Here, the agile app development approach can be used to get over most of the hurdles faced by the developers. To know more about how agile methodology manages to do so, have a look at some of the benefits of using agile for app development. Benefits of Using Agile In Mobile App Development Process? Agile App Development is hands down one of the mobile app development approaches around, which is currently favored by a majority of mobile app developers. The real reason why startups, SMEs (Small to Mid-scale enterprises), and even Fortune 500 companies are opting for this app development approach is because of the various functionalities it offers. 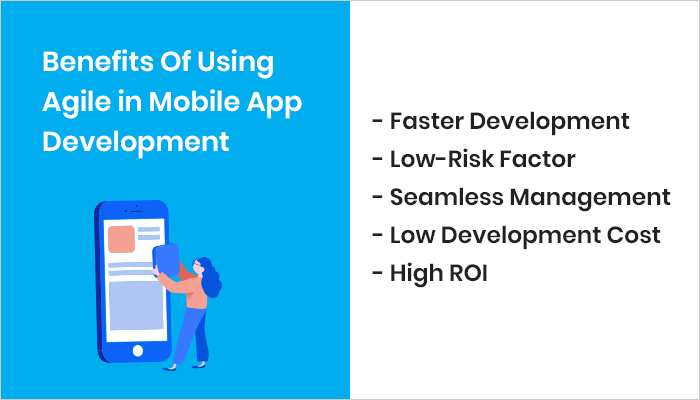 By choosing the agile methodology, mobile app development companies can now separate their entire product lifecycle into small segments known as sprints. These sprints are great for measuring the improvement of the project while eliminating the chances of having redundancies. Here RAD also known as Rapid App Development is used, which is basically a form of Agile Development Methodology that mainly emphasizes on how the software is working along with various stages of testing. In simple words, we can say that RAD is less documentation and more implementation. As you might already know by now, the entire app/software development project is divided into much smaller sprints i.e. modules. These sprints can further be treated as the sub-projects of the overall development project where different teams can work on them independently and speed up the development process. Agile Scrum methodology can also be used as a tool for calculating the different types of risks that can surface in the project and then help in solving them. This can also be said to be one of the major benefits of using the agile development approach. With the help of the agile method now you can make your project management process smooth and seamless. Because the complete project is divided into sprints, the project becomes easier to manage by assigning different tasks to multiple teams like app developers can handle the programming part and testers can focus on the software or app testing. In agile scrum method, each and every step is well calculated, planned and executed so that it can deliver the best outcome possible for the project and act as a justification for the app development budget invested in it. Another advantage of using the agile approach for mobile app development is the high rate of ROI. The agile app development method allows startups to enter the market with just their MVP which they can upgrade later with each iteration of the application. With this, the emerging mobile app development companies can improve their ROI along with their mobile app. How To Adopt Agile App Development Approach? The adoption of agile app development approach in companies is simple and easy. Apart from this, it is a standardized approach which further allows the mobile app developers to understand the depth structure of the project. For instance, the app developers that work with Java-based frameworks like Grails, Spring, Vaadin, Struts etc are quick in understanding the use of agile mobile app development. In addition to this, developers can also opt for object-based models for dealing with the complexities caused by the low-level programming languages. At present, a majority of mobile app development companies are on their path of adapting to the agile scrum approach, particularity to the model-driven methodology. The agile methods are also gaining popularity due to their high usage for projects related to front-end and back-end development along with the core structure of the app/software-related project. Also, if you are interested in reading more such articles related to the topic of mobile application development then free feel to follow MobileAppDaily. To stay updated with all the latest updates from the mobile app industry, make sure to click on the ‘Subscribe’ button.